Wielded with due care and attention, Pi can certainly improve your mixes. Many will find it unpredictable, though. Can achieve punchier results. Nifty grouping setup. Helpful global bypass. Useful Channel Weighting. Three group processing modes. Pitched sounds can go awry. Large processing buffer. 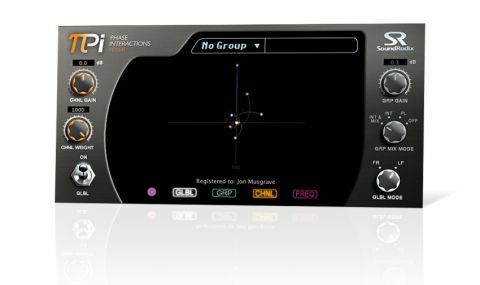 Having impressed us a few years ago with its point-and-shoot Auto-Align plugin, Sound Radix has turned its attention to the issue of frequency/phase-based interactions in a mix. The result, Pi (subtitled Phase Interactions Mixer) aims to minimise phase cancellations across multiple tracks and thus make your mixes punchier. A VST/AU/RTAS plugin, Pi works by dynamically rotating the phase of separate tracks, and it utilises its own sample-accurate inter-channel routing to communicate between them. At the global level, options include both Full Range and Low Frequency modes (the latter is optimised for material below 800Hz). There's also a global processing switch, enabling you to bypass processing for all instances of the plugin while retaining individual gain levels. "Each plugin includes a parameter called Channel Weight. Turning it up makes the track more influential on the other tracks." Pi allows up to 64 groups of tracks to be defined, each group set to one of three modes. Phase Lock (PL) retains the phase relationships of the grouped tracks, optimising them 'as one' against the overall mix. Both Internal and Internal & Mix modify the phase relationships, the latter additionally referencing the overall mix. The 'overall mix', incidentally, means any tracks with active Pi plugins inserted. Each plugin also includes a parameter called Channel Weight. Turning it up makes the track both less influenced by other tracks and more influential on the other tracks. Clever stuff. Pi does take a bit of getting used to and is certainly no 'quick fix' processor. In our efforts to get up and running, we soon discovered that it's capable of introducing audible pitch artefacts to tracks as it attempts to modify their phase in real time. This can alleviated by grouping tracks that are designed to work together, such as the elements of a drum kit. It's also clear that in the case of multi-miked sounds, opting for one of the Internal processing modes can add punch but also adds subtle pitch changes to the tails of sounds (snare drum ring, for example). The solution can be found in the Channel Weight control: whacking this up for our snare drum made it much less of a victim of the other channels. In fact, as we moved further into our mix, we found that other pitched instruments with longer decays (piano, guitar, bass and synth) all benefitted from adjustments to this weighting control. Even so, at times it still wasn't enough, and although we like the idea of processing everything with Pi, some sounds just didn't work well enough with it. Of course, the plugin doesn't have to be used on every single track, so this shouldn't be viewed as a bad thing. The only other thing worth noting is that the processing delay introduced by Pi is considerable, and with its suggested position being the last insert slot on each channel, we felt some lag when adjusting plugins before Pi in the signal chain. It's always difficult pushing the boundaries, and Pi certainly does that. Deployed with care, it can be pretty useful, so long as you use and trust your ears.